The System 977 is designed for police vehicles and modern marine vessels. The option to have a wireless module integrated internally in the System 977 housing makes the system highly versatile. The System provides full-duplex intercom among all crewmembers and radio push-to-talk capability from four positions. Sophisticated electronics ensure that only the keying operator's voice transmits over the radio. When a crewmember keys the radio, all other microphones are locked out of the radio transmit circuit. Intercom communication between other positions remains active during radio transmission. Plug and play components and the fewest components of any leading system make the System 977 easy to install, saving time and money. With the option to have an internal wireless module included in the System 977, it is the easiest and fastest wireless system on the market to be installed and deployed. Learn more about Setcom's police wireless capabilities. Within minutes, the vehicle's driver / operator, officer, or spotter, can be wireless and communicating with other crewmembers and the vehicle's radio up to 1,200 feet away. Internal wireless module is compatible with the Liberator wireless headset. 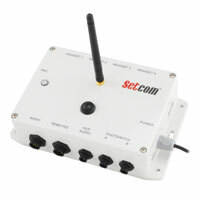 Additional wireless headsets can be added to the System using Setcom's Liberator wireless headset kit. Entertainment Audio Mute - Seamlessly listen to third-party audio devices connected to the System 977. When an incoming radio call is received, the entertainment audio is automatically muted so that the radio transmission can be clearly heard by all crewmembers. Advanced Electrical Noise Elimination - Industrial vehicles have numerous electrical systems which can cause significant noise issues for radio communication devices. The System 977 has electronic countermeasures to eliminate those potential issues and provide clear audio for crewmembers.